Spring time is here! With Spring comes chirping birds, sunshine, and more time spent outdoors. Ava and I are always on the go. I have discovered a few necessary items that help make our outings more enjoyable. This isn't everything that I take with us but these are what I think are the most important items to have. Check them out below! 1. 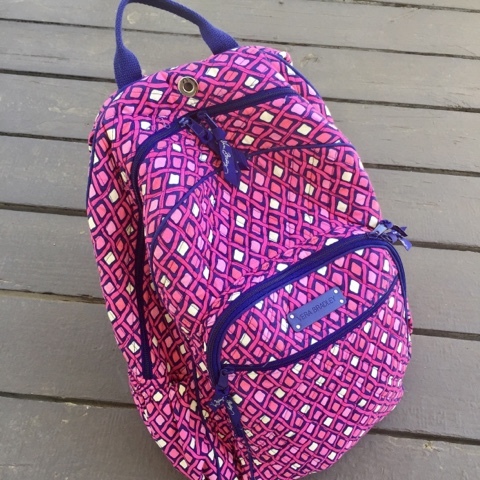 Vera Bradley Backpack - Backpacks are great because they keep your hands free. I like to use this particular bag for longer outings. It is big enough to hold all of our things, the straps are comfy, and it has zippers so nothing can fall out. I also have a smaller backpack for short outings. 2. Blanket - You need a great blanket! I have a heavy duty waterproof blanket for full on picnicking, and I have a cutsey bohemian blanket for sitting while I watch Ava play. 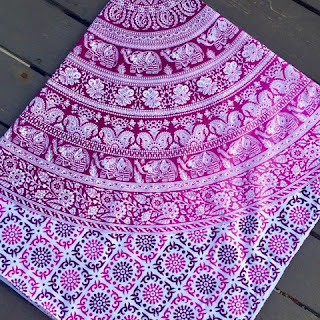 The boho blanket is small enough to fit in my bag and comes in handy when seating is limited at the playground. 3. Sunscreen and Bug Spray - No one can have fun if they are getting sunburn or bit by mosquitos. 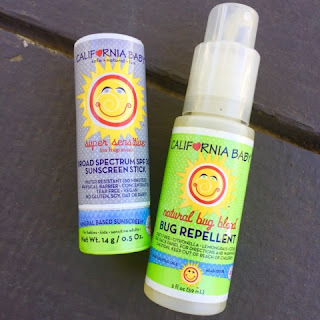 I love this bug spray by California Baby, it smells yummy and actually works! 4. 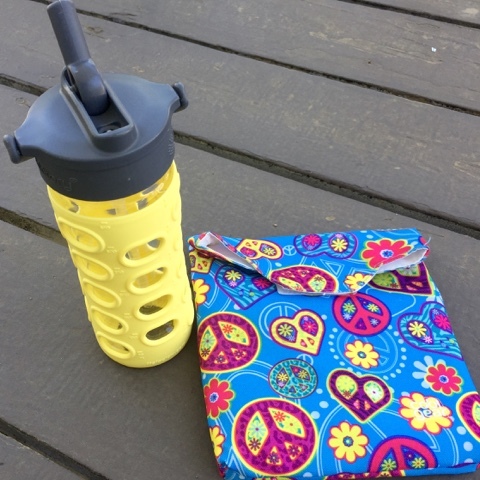 Reusable food storage - This Lifefactory Glass Water Bottle comes in handy when we are out as it can be refilled. Reusable food storage bags are good to have also, if we don't finish our food, I can close the container back up and not have to throw anything away. This also reduces our trash as I am working on becoming zero waste. 5. Good walking shoes - Your feet will thank you! I have a cute and comfy pair of Areosole sandals that I could walk in all day. 6. Carrier or Stroller - Kids tend to get tired faster than adults. I made the mistake of going on a walk without my jogging stroller or carrier and never again will that happen! I think I heard " Mommy, I'm tired" enough to last a lifetime! So depending on where you are going, have a carrier or stroller with you. I hope you found this list helpful. It seems like a lot of items to have to carry around but I'd rather be prepared than not. 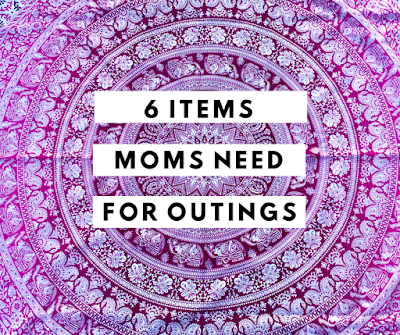 What are some things that you take on your daily outings? Let me know in the comments below! Until next time. I love this list!! Always all of these!! Thanks for sharing. Love this list! sunscreen for sure! i've been considering moving from a diaper bag to backpack, so funny you listen this! Great list! I have been on the look out for a backpack to take out with my girls. One thing that I try to always have as well is a travel sized first aid kit. You never know when you will need a bandaid or two. Yep! And wipes ;) lol. sooo many uses for baby wipes! Thanks for sharing this! I'm about to become a mom so I am always on the look out for good tips. backpacks are a must especially when toting 3 kids around and you have to carry stuff for ALL THREE of them and yourself. we always make sure to carry a water bottle around with us but maybe it's because i'm a mom of some very hungry boys but we ALWAYS need to have snacks on hand and a few toys! A backpack is a must! We always take one one our outings. A great way to take everything you need but stay hands free. Great list! I can see how much all of these will help! Sounds like the perfect start to a day of being outside with the family. Yes to backpacks! I always make sure I have my water bottle. My son is still nursing so I have to stay hydrated. The backpack! I started off with a cute diaper bag, but I now carry my a black, plain backpack. Its so much more functional!! I think we all start off with cute diaper bags then we get real and get a bookbag lol. Love this! 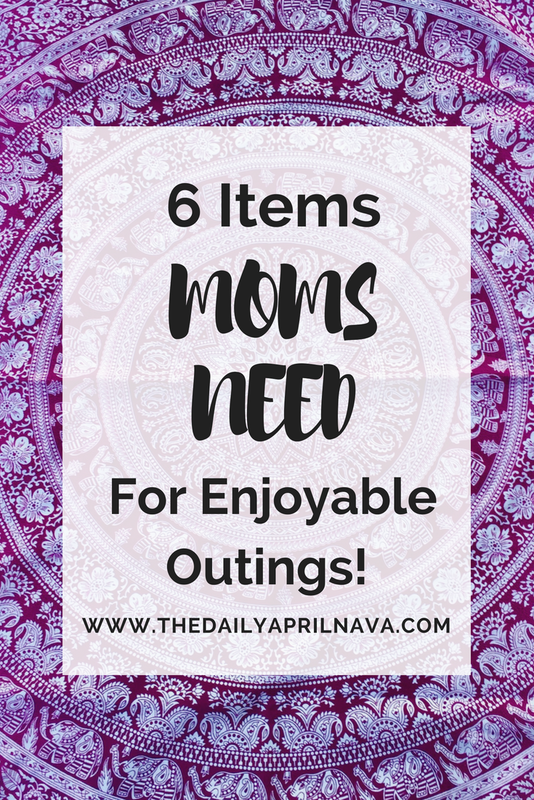 My kids are not little anymore and I still travel with these essentials! Yep, I have most of these at all times! 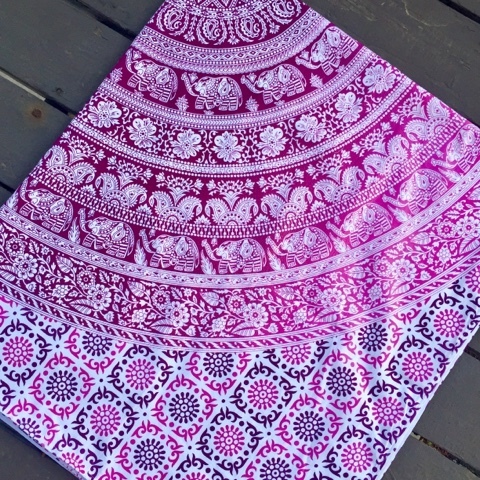 Your blanket is much prettier than the old, ratty towel we use though! Thank you, I just upgraded my blanket lol. Thanks for the list! I find the backpack to be super helpful and the reusable water bottle/snack container. Love this list. Makes me feel not so crazy for packing like this for outings. My husband can't understand why we need it, even though we use most if not all of it. This is right on! This is how I survived three young kids on my own as a stay-at-home mom. I definitely agree with wipes and hand sanitizer! Great list! Love that blanket your mom made for you! And thanks for the heads up about the bug repellent. Not a fan of the one we currently use. Thanks for the great list! 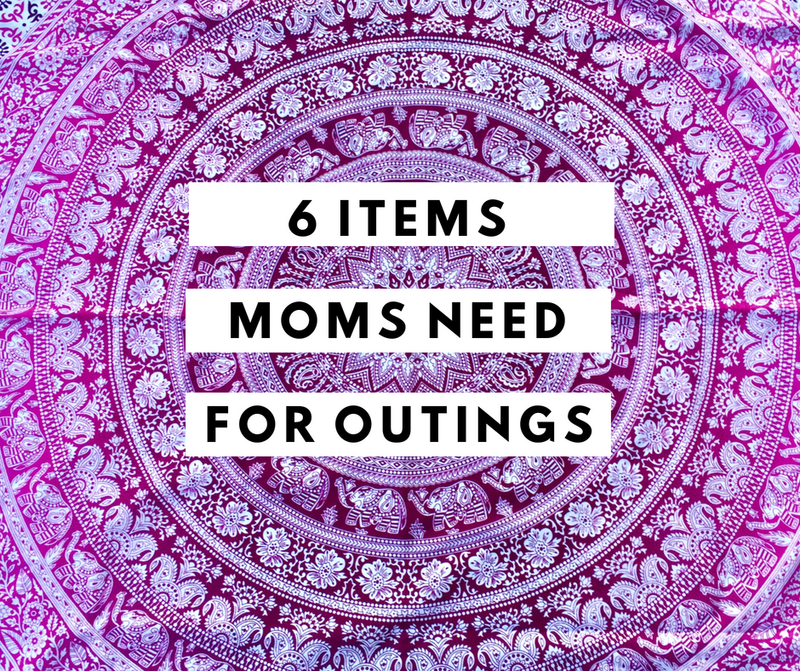 I have to agree with this list, and add for us hair ties and hats (seasonally appropriate). I get "the sun's in my eyes!" A lot from my bunch! Great lis. I always forget the bug repellent.